The Alberta Securities Commission (ASC) is an industry funded regulatory agency responsible for administering the province’s securities laws. 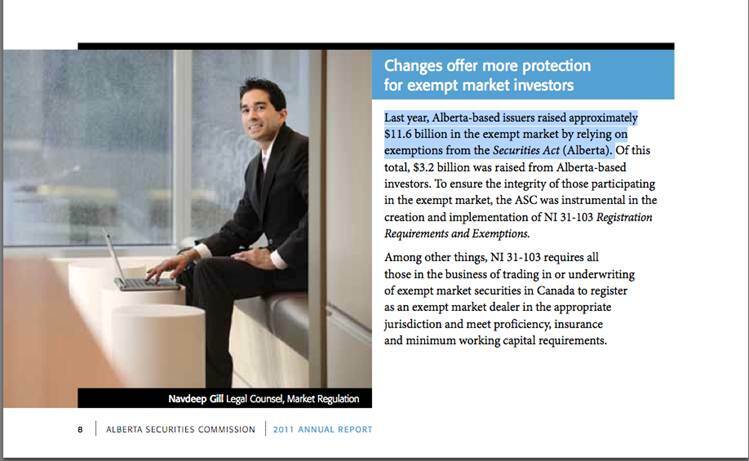 The ASC is entrusted with fostering a fair and efficient capital market in Alberta and protecting investors. 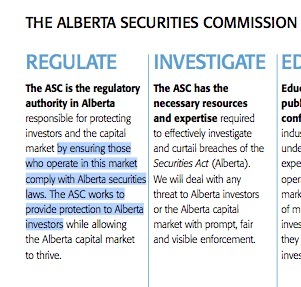 The ASC regulates the activities in Alberta of the Natural Gas Exchange Inc., the Investment Industry Regulatory Organization of Canada and the Mutual Fund Dealers Association of Canada Along with the British Columbia Securities Commission, the ASC oversees the operations of the TSX Venture Exchange. The image below is from page one and the highlighted portion says they ensure that those who operate in this market follow the law. The below image is from page eight, and describes the raising of nearly $12 billion by parties NOT required to follow the securities law. Beyond these two images, there are another approximate 5000 examples of the ASC granting permission to violate Alberta laws, to investment parties, usually without a single warning or public notice to those who might be affected. Profits increase by orders of magnitude to investment firms when they can sell things which do not have to meet our laws. Especially when they can be sold without warning of that fact. Concrete Equities, Plantinum Equities, Foundation Capital, and a few thousand others have taken advantage of this regulatory game. NOW you know why the person who heads the provincial securities commission salary is nearly four times as much as the premiers.